Paul C. Bragg (1895-1976), Nutritionist, is one of the earliest advocates of the wellness movement in America. He was well known for the Bragg Health Crusades, the Bragg Healthy Lifestyle, deep breathing, water fasts, organic foods, drinking water, juicing, exercise and listening to one's body. "The food you eat today is walking and talking tomorrow." Paul Bragg was a strong advocate of the healing power of exercise. Near the end of his life, in 1970 he started a free exercise class called the Health & Happiness Exercise Club on the Fort DeRussy lawn, Waikiki Beach, Hawaii, USA. Bragg suffered an accident in 1976 at the age of 81. He was injured by a wave in the surf in Hawaii. His health started to decline, and six months later died of a heart attack in Miami, Florida. "There is no simpler, more effective treatment to restore health and quality of life than the cure Mother Nature provides through natural living." "It matters not what your present age is or what your physical condition. If you obey nature's laws, you can be born again." Natural Health legend has it that a 15 year old Jack LaLanne was in the audience that day. "I will never, ever, ever forget what he said," Jack recalls. 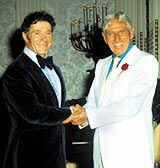 Paul C. Bragg was the person who inspired Jack LaLanne to be physically born again. And thus, Jack LaLanne, the man who would become the single most recognized worldwide icon for the personal benefits of proper diet and exercise, was reborn thanks to the Natural Health message of Paul Bragg. "The choice of which road to take is up to the individual. He alone can decide whether he wants to reach a dead end or live a healthy lifestyle for a long, healthy, happy, active life." The amount of high quality information on the life of Paul Bragg, available on the Internet, is rather disappointing. Between Paul and Patricia Bragg, what is known about Paul's life is more myth than reality. Paul misrepresented his actual age. Patricia Bragg likes to call Paul her father even though she actually married into the family by marrying Paul's son Robert. Patricia got divorced from Robert in 1956. Paul made it to the ripe old age of 81, even if he did fall short of his target of 120 years. Paul Bragg should be remembered for maintaining a high quality of life through exercise. And, for authoring some 40 different books on health. Paul appears to have been more interested in making money and promoting his business than in personally living what he advocated. Many of ideas are pure showmanship and quackery. Bernarr MacFadden was the source of inspiration for Paul Bragg. And, that Paul in turn inspired Jack LaLanne. "Paul C. Bragg, called the 'grandaddy' of the health food movement, died of a heart attack Tuesday in the emergency room of South Shore Hospital. He was 95. Dr. Bragg, a registered physical therapist whose home offices are in Hawaii, Palm Springs and Boston, was in Miami Beach to speak before the Second Annual Health, Diet and Physical Fitness Show at Dinner Key Auditorium. ... Patricia Bragg said her father was injured by a wave in the surf six months ago and his health began to decline after the accident." -- Deaths: Nutritionist Paul C. Bragg, 95. The Miami Herald, page 10-B, December 10, 1976.